Vancouver 3, Spokane 0: Christopher Bec hit a two-run home run and the Canadians (13-12) beat the visiting Indians (8-17). The game was called in the sixth inning during the second rain delay. The Indians lost for the fourth straight game and fell to 0-11 on the road. Vancouver starter Jose Espada (1-3) struck out eight over five innings and allowed one hit – a third-inning triple by Troy Dixon – and one walk. Hans Crouse walked one in one inning but did not return after the first rain delay in the second inning. Tri-City 5, Everett 1: Henry Henry struck out seven over five innings and the Dust Devils (13-12) beat the visiting AquaSox (12-13). Henry (2-1) allowed one run on three hits and a walk. Owen MIlle rwent 3 for 3 with a double and RBI for Tri-City. 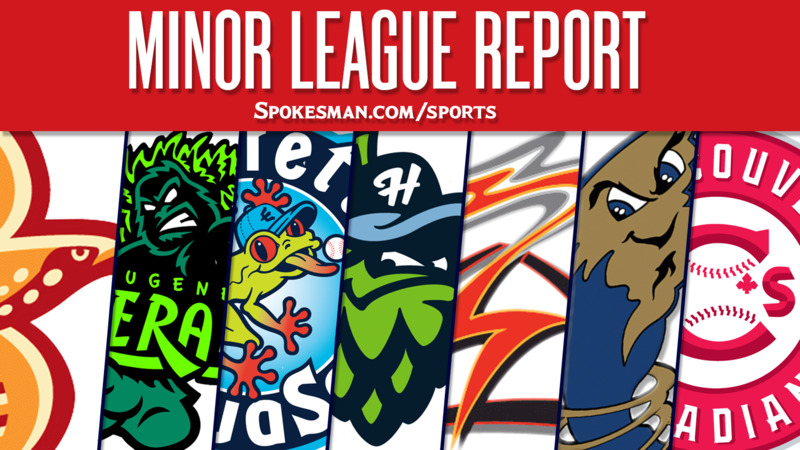 Boise 7, Salem-Keizer 6: Cole Anderson walked, stole second and scored on a single by Marr Hearn in the ninth inning and the visiting Hawks (14-11) edged the Volcanoes (14-11). Anderson hit a three-run homer earlier in the game and Hearn finished 3 for 4. Joey Bart, the second-overall pick in the 2018 MLB Draft by San Francisco, hit a grand slam – his fourth home run in five games for S-K.
Hillsboro 4, Eugene 2: Francis Martinez homered and Jose Caballero drove in a pair of runs and the visiting Hops (17-8) handled the Emeralds (9-16). Bryan Valdez (2-0) picked up the win with 3.2 innings of scoreless relief. He struck out five and allowed two hits and a walk. Organization prospect rank (by MLB.com) in parenthesis. Tulsa 8, Frisco (AA) 1: Will Smith and Jacob Scavuzzo hit home runs and the Drillers (47-40) beat the visiting RoughRiders (34-54). Kyle Lobstein and two relievers held Frisco to two hits. Destin Hood homered for the RoughRiders, his third of the season. Down East (High-A) 6, Buies Creek 3: Alex Kowalczyk hit a three-run home run in the sixth inning and the visiting Wood Ducks (43-46) defeated the Astros (50-38). Ricardo Valencia went 3 for 4 with a two-run shot in the eighth. Steven Bruce struck out six over seven innings and allowed one run on four hits and walk. Leody Tavaras (No. 1) went 1 for 4 with a walk and an RBI. Hickory (Low-A) 5, Delmarva 1: Ryan Dorow went 3 for 5 with a solo home run and the visiting Crawdads (39-37) beat the Shorebirds (46-40). Miguel Aparicio (No. 17) went 3 for 5 with a run and RBI while Bubba Thompson (No. 6) went 1 for 4. Sam Huff (No. 25) went 0 for 3. Starter Tyler Phillips (No. 30) struck out 11 over seven innings and allowed one run on three hits and a walk. Published: July 10, 2018, 5:55 a.m.